I’m starting to build up the gear for the kitbiz to get off the ground, and the first large investment just arrived at the shack. Thanks to some blog posts from Eldon WA0UWH, I found AmScope.com, who sells all manner of microscopes for low prices. I ended up finding a scope that was very similar to the one that I worked with at Tek; the SM-4T. It’s a 7x-45x trinocular stereo zoom scope with a double-arm boom. I also ordered a 80-LED ring light with a variable brightness control. The beast barely fits on my tiny construction bench, but I’ll have to deal with the cramped space for now. Here’s some of my impressions after assembling and using it. First off, the base is massively heavy; which is great for stability but no fun when transporting it. I thought the poor UPS drive was going to get a hernia getting it off of his truck. The fit-and-finish is pretty good. Not quite the same as the high-quality brand name microscope at Tek, but I felt like it was good for the price I paid. The manual is terrible. I’m still not sure that they sent me the right manual, since the diagrams in the once I received show a completely different model. But the back of the manual does show the parts for my microscope, so who knows, maybe you just get some generic manual for all of the different models. The Engrish factor is pretty high, as you might expect. 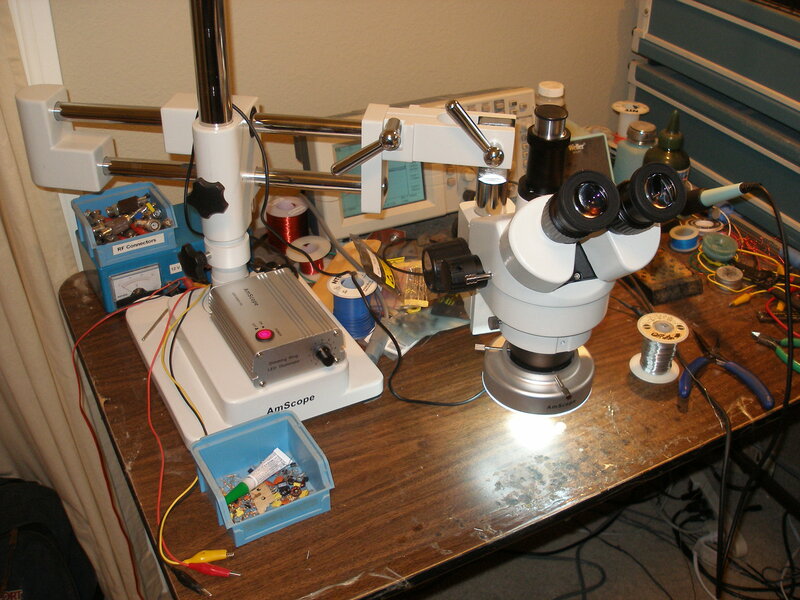 Fortunately, I was still able to easily assemble the microscope by referencing the photos on the AmScope website. The image quality is quite good, although the field of view is a bit smaller than my Tek microscope. The interpupillary distance and diopter setting is fully adjustable. Once I got them set correctly, the microscope was a pleasure to use. The 80-LED light did a good job of providing bright white illumination for the circuit boards that I examined. My first impression is that I’ve received a good value for my money. AmScope claims that their production line is the same one that manufactures microscope for Zeiss, Leica, Nikon, and Olympus. Based on the quality, that certainly seems like a credible claim. It’s a bit spendy for the average homebrewer to purchase, but if you are serious about doing a lot of SMT work, I think that these microscopes would be an excellent choice for the shack. It sure beats the $10 photographic loupe that I use to inspect my SMT soldering! Your eyes will thank you. That’s for sure. Since I will be doing a lot of SMT work in the future, I figured this was a must-have. Hi Matt, it’s a pleasure to meet you. Thanks for taking the time to write! First off, I want to make it clear that I’m not an engineer by trade. I have an AAS degree in EET and I worked as a technician for the last four years. That being said, my college education was great, but most of my advanced analog knowledge came from self-study. More specifically, much of my learning was due to my studies in amateur radio. I don’t know if you have any interest in RF, but if you do, you should look into some of the ham radio “QRP” books out there, even if you aren’t a ham. One book you should get regardless of you interest in ham radio is the ARRL Handbook. This is an excellent general, practical reference for analog electronics. At least half of the book would be useful to anyone interested in analog electronics. The other ham radio related books I would recommend is Experimental Methods in RF Design and Solid State Design for the Radio Amateur (which is out of print). A good general purpose analog electronics book is The Art of Electronics. A lot of engineers consider this to be their “bible”. As for videos, there is a good series on iTunes U from MIT. I don’t have the exact name, since I recently ditched Windows & iTunes, but it shouldn’t be hard to find. You could also look at the MIT OpenCourseWare series for some free material. 4 & 5) I use the AVR microcontroller as my embedded system of choice. There are tons of choices out there, but I like AVR because of the open source gcc toolchain that I can install on my Ubuntu PCs. You might want to look into the Arduino as a good first step. It’s like the BASIC programming language of the embedded world and there’s tons of information out there. Finally, look at the blogs in my blogroll. You’ll find a lot of excellent information at many of them. Put them in your feed reader. Also, start following Makezine, Hack-a-day, Adafruit, etc. Those will be good jumping off points for more learning materials. Hope this give you a good start. Let me know if there is more specific information that I can help you with. Come back any time for a visit! Thank you for responding to my post so quickly. Sorry that it has taken me so long to respond back. But the weekends are just so short and a lot needs to get done before Monday comes. Also, I have been in the process of looking for a new job for the past couple of months that I can build into a career. I appreciate your openness and willingness to help me get started in my analog education. You have given me a great start, as well as opened me up to a specific interest now in RF. Since I am like you and am not an engineer by trade, I have been looking for a new job that I could learn electronics as a craft and build my specific craft into a career. I have been looking for many other career opportunities as well to have safeties to fall back on. I would love to branch into RF research and design, I just need a lab or industry to take the chance to build me into a proficient worker. I am still interested in biology/medicine; so maybe eventually I would be able to apply the skills that I pick up in RF/electronics and merge it back to my current knowledge. Your reply to my post was very comforting and informative. I appreciate you taking the time out of your busy schedule to reply to all of the parameters of my questions\inquiries. I have always been very technological and mechanically driven in science. I loved my undergraduate experience as well, but I do wish that from the start I could have got exposure/ experience in electrical engineering, or at least been better acclimated with the physical principles and theories. But as you were so inclined, so do I plan to self educate. But with this self education I would appreciate a career that can mentor me as well. I would welcome the opportunity to become a well educated RF engineer. RF technology has a great place in a vast array of career paths. I am thinking I would be interested in sending signals-to-receiver to transmit data: voice, text, picture, and radio control devices from a distance, etc. My minimal experience with ham radios was when I was a young kid, about 12 years old. My uncle was dying of cancer and we would visit him about every week as a family. He was so interested in ham radio operation. He had a really nice setup and even though he was sick, he would take the time to explain how all his equipment worked, and who he had been talking to for the past week. On one of our visits, he surprised me with a “base station” and antenna. Back then, this got me interested in radio frequency transmission, but I never really got into how to make modifications to signal receiving and sending. I will look at all of the literature and material that you have referred to me. I have been applying to many research positions; the intention is that they would be looking for someone to come on board and be part of their research/design team, then learn the technical stuff as they go. But every position has come back looking for someone with more experience. How can I get more hands on experience if no one will take the risk? Do you know of anyone/ company in the Philadelphia area that you think would be willing to take a chance and educate me in their research area? Also, I use Windows Vista Ultimate, XP Professional, and Ubuntu 9.10. Can you only use AVR microcontroller with Linux? Is AVR microcontroller software free? If free, can you direct me to the website to download it? And any supplemental information on how to use and program with AVR, would much appreciated. Could you email me when you respond to my post on your blog? This way I can read and respond in a timely manner as well as get the update if I am on the road. I truly appreciate all of your advice and insight. Hope all is well. If you don’t mind me asking, where do you work now? As for your studies in amateur radio, do you broadcast a show? Also, ham radio experience, do you build your own ham radios for broadcasting or other purpose? Thank you for your blog/advice/insight; I will keep exploring more of your past and future posts and other blogs in your blogroll. Sorry that I got personal in my last post, asking you where you worked and if you could help me find research in the Philadelphia area…I can only assume that this is why you have not responded to my post. But if it is for other reasons, then at least I have covered this as a possibility…Either way, I apologize and I will keep my future posts as only direct reflections to your posts. Sorry for not replying to your last post, Matt. It wasn’t because of any of your questions, I just lost your comment in the shuffle. I’m the caretaker for our son during a good portion of the week and on many evenings, so I’m doing a lousy job of keeping up on comments and e-mails right now due to lack of sleep and time. I will try to address all of your questions here in a moment. Matt, I would love to pontificate greatly, but due to time constraints, I have to keep this concise. I really enjoyed hearing about your journey in technology. I am currently self-employed (I’m just starting a home-based ham radio kit business), but I just resigned from a career at Tektronix as a RF technician. Unfortunately, technician work is drying up in the US. I would love to encourage you to pursue your RF engineering dreams, but be aware that the job market is not like it used to be. Many places (even at Tek), it was possible to work your way up to become an engineer even if you didn’t have a BSEE. However, now it is very difficult to do, especially at a large company. You might be able to do that in a small business, but probably not at a large, established company. Unfortunately, I don’t have any contacts on the East Coast, so I cannot help you there. I would highly encourage you to think about getting a ham radio licence. The Technician test (entry level) is pretty easy to learn after a few weeks of study. It’s a multiple choice test and you don’t have to know Morse Code any longer. Getting into ham radio homebrewing has been one of the most educational things that I’ve done in my entire life; without exception. Let me know if you ever think of trying it, and I’ll see what kind of resources I can dig up to help you (it’s been close to 20 years since I got my licence!). The USBtinyISP programmer from Adafruit is also a good & cheap way to get started in programming AVR. Regarding broadcasting, strictly speaking we amateurs cannot broadcast, only initiate station-to-station contacts. I do build my own radios, although I also have some commercial radios. Without a doubt, it’s much more satisfying to make a contact with a radio you built with your own hands than with a commercial radio.